Dec. 5, 1941: There’s almost too much interesting news on Pearl Harbor Day minus 2. Josephine Trout Barnes is reunited with her baby girl Camelia/Camellia/Carmelia (newspapers in the Linotype era sometimes had a fluid sense of spelling when it came to names), whom she abandoned at a downtown hotel. Ann “Black Widow” Forrester is sentenced to prison on charges of pandering. Special investigator Wallace Jamie appears on Mayor Fletcher Bowron’s weekly radio program to deny charges that there is a secret “listening post” in City Hall. And Tom Treanor interviews playwright Erskine Caldwell, who gives a firsthand account of Soviet fighting against the Nazis. Jimmie Fidler says: The V lettered sweater on Joan Blondell is not war propaganda; the garment is a relic of her Venice High School days. This entry was posted in 1941, Books and Authors, City Hall, Columnists, Comics, Crime and Courts, Film, Hollywood, Jimmie Fidler, Tom Treanor, World War II, Zoot Suit and tagged #1941, #eavesdropping, Abandoned babies. Bookmark the permalink. Tommy Lydon? Must be Jimmy’s brother. Woo Hoo! And a Theremin concert by Clara Rockmore!!! Probably the most fun instrument I’ve ever had the pleasure of playing! Ms. Rockmore was a virtuoso on the instrument and if you can find any recordings by her, give them a listen. You can thank me later! Paul Robeson’s no slouch either! 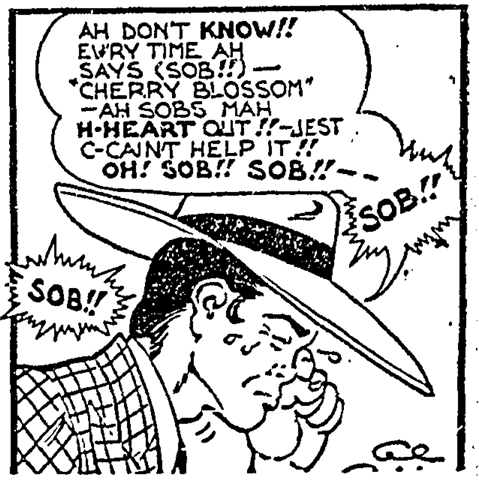 @Jamzo: Yes, a nice surprise since Al Capp didn’t introduce Zoot-Suit Yokum until 1943.